When you are cooking dinner, even something as simple as pizza made from refrigerated biscuits, it's always nice to have a beautiful helper. This is the latest addition to what will eventually be the most.expensive.quilt.ever. I'll supply details if anyone is interested. My friend, Terri, added these adorable little sketchbooks to her shop the other day. I grabbed them for C and L, before someone else could beat me to it. I dropped them off this morning, and the books already have some original artwork on the pages. Thanks, Terri! And I'm IN for the quilt-along based on blocks in this book. I'll be using LouLouthi and solids. Two blocks a week. I should be able to handle that, right? 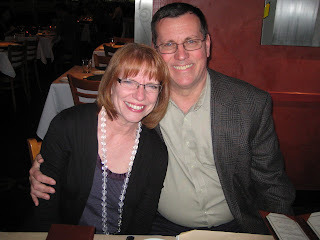 Tomorrow Mark and I celebrate thirty-eight years of marriage. Being married to your best friend is the best! Congrats on the wedding anniversary. Mr. Romance and I will be 39 years on the 24th!. I also just ordered the Farmer's Wife book and will jump on that bandwagon after it arrives. Funny, I was considering LouLouthi but haven't decided for sure. Aw you two look so happy! Happy Anniversary to you both. 38 years! Congratulations! The LouLouthi fabric is beautiful and will look fabulous in that QAL! Look forward to seeing your blocks! Happy Anniversary! My husband and I will be married for a measley :) nine years tomorrow, so I hope June 8th will be as lucky for us as it has for the two of you! I too am doing the Farmer's Wife QAL! I can't wait to see yours! I'm in love with Loulouthi! Congratulations, you are an adorable couple! Happy Anniversary! Have a lovely day, and hard as it may seem, leave those gorgeous fabrics alone for the day! Happy anniversary!!! You were a June bride! We celebrated 42 years last week. Isn't it grand? I can't wait to see your Farmer's Wife blocks. Are you making a Hard Rock Cafe quilt? Congratulations on your almost anniversary!! Such a sweet picture of you two :) And I must now, what is the most-expensive-quilt ever???? Love that you're doing the Farmer's Quilt QAL with Loulouthi, sounds beautiful. Will you use a variety of solids, or just one? Congratulations on your anniversary!! Love the picture of you two. Want to hear more about the expensive quilt with the Hard Rock tshirt. Can't wait to see what becomes of the Sherbert Pips! I just laid out two charm packs for baby quilt tops but can't get to the machine yet. Wow, congrats on 38 years! You guys look adorable together! Love the shot of your little helper, she's sweet. And a cute little top she's got on. You are getting really good with that camera, my friend. I just am hearing about the QAL. It is tempting mainly because I wouid so love to do a project with you!! Oh my, you are both an inspiration. Hey, nice to finally meet you - that's the first photo of you I've seen! Congratulations on your wonderful anniversary. So, are you going to Venice???? Your quilt a long fabric choice is ace. It will be amazing. And I'm all for beautiful helpers, too. I've got plenty of beauty, not so much help (ahhh, teenagers). CONGRATS on 38 years! That's awesome! I so regret not ordering Sherbet Pips when I had the chance! BTW, now that I know your weakness is red poka-dots, I'll have to stock more. tee hee hee! Congratulations on the wedding anniversary, and on a good day shopping. I think it's fun to see what other quilters pick up on their forays out into the world. I, too, have realized that I use online shops to augment the locals--although like you I like to support them as well. Looks like you have some fun projects ahead of you!